Thanks for talking about this subject. To me, a God who was angry at our sins until He beat the crap out of His Son implies that there was a time in the past when He was not graceful. He only became graceful after His wrath was appeased. This doesn’t seem to me to be consistent with the Father that Jesus revealed. God was angry at sin (and my guess probably still is) because of what it does to us and to others in our quadrant. One penalty of sin is that it separates us from God in our mind (not God’s). To me, we (humanity) killed Jesus. But in return Jesus offered healing by absorbing this penalty of separation with the biggest display of nothing will ever separate us from the love of the Father. Call me Mr. Marcion, but I do not see the value of the OT in any of this. The OT was written by Old Covenant writers. My personal heresy is that they generally didn’t use a New Covenant pen. The OT was canonized more than 2K years ago, so who knows how much exact wording we have. For example in the chapter of Isaiah alluded to in the podcast there are inconsistencies. On one hand there is the Isa 53:10 line, but earlier in verse 4 it mentions that “we esteemed Him“ to be stricken by God (i.e. from our perspective God struck Him). These are just my beastly heresies. But for anyone who doesn’t agree with them be ye forewarned, there will be wrath to pay. First I will curse you with cheezy pop songs that you won’t be able to get out of your head, and if that’s not enough there are much cheezier woes to follow …. I kind of figured you would weigh in on this. :) When I was setting up this post I actually was thinking you might say something. And I really do appreciate it. Along with what Kap said in the podcast, we really aren't wanting or trying to split hairs with anyone about this. We realize that there are various views on all this, when it comes to the subject of God's wrath/anger, and what happened on the Cross. The main thing we wanted to point out is God's solution to the problem, no matter what opinion anyone has about what the actual problem was. God took care of it, and we can rest easy in His love and grace. That's really the main point of this particular podcast. I guess i have to weigh in on this as well you all. God from day one with Adam and Eve had Mercy and Clothed them both. God is the same today, yesterday and Forever. in the old testament, yet could never live in anyone for all was unclean as in us humans. So Christ came to fullfill the law and bring in a new covenant Hebrews 9:16-17. And after this new covenant the whole world has been forgiven (reconciled) but one is not saved until they ask for it through the ressurection, and thus be sealed with the Holy ghost, Ephesians 1:13. Bottom line through Christ the Believer has been made perfect and forever Holy In God the Fathers sight. From God's vantage point you being made Holy By one sacrifice, God the Father whom can see no sin does exactly this, makes you clean so The Holy Spirit can live in you the believer, for God can not see sin. Jesus purged all sin out of the Fathers sight, So the Father through the Holy ghost can live in you. And thus you ask for this Holy Ghost to take over as he did with Jesus. Thus you no longer live and you no longer do the work, it is the Holy Ghost that does it all as this same Holy ghost already did with Jesus. The value of the old testament writings is that it points us to the cross. 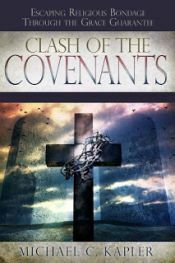 The whole purpose of the old covenant was to bring us to Christ who is the mystery revealed. A judgement against sin needed to be satisfied. It was the blood of Jesus Christ that would provide that. It was sin that God took His anger out upon at the cross. Since Jesus became sin for us, He was the recipient of that. As Paul stated, this was a plan before the foundation of the world. As is usually the case, I don't think man can take credit for this one either. Hi Kap. In my previous life in an evangelical Church that was their understanding also, that the value of the OT was to point us to Christ. This was very true for the first century believers especially those with a Jewish background like those (possibly in Rome) the writer of Hebrews was addressing. From my experience, more often than not it has been the Holy Spirit and relationships with other believers that has pointed to Christ more than the OT (and I acknowledge that this might not be the experience of others). Although I suppose that the threat of going to hell may also be up there on the list. I also appreciated Homward’s comments. Alright Kap brace yourself, a second wave follows the Madonna tunes - a blast of Bieber. Hey Jim. I get what you're saying. I know most people today aren't going to thumb through the old testament in order to find the answers that Christ has brought us. Admittedly, I rarely find myself looking at it either :-) But if nothing else, I think it provides some answers about the big picture historically. So we're good. No Bieber, right? I mean seriously, not even Satan would do that to me! Thanks for your reply Kap - I've called off the evil sound waves.